Home > Blog > What Can I Expect At My First Dental Visit? One of the easiest things you can do to invest in your own health is take care of your teeth, gums, and mouth. Most people know that you should brush twice a day and floss to help make sure you avoid cavities or gum disease. However, many people don’t take the extra and necessary step of seeing a dentist twice a year for checkups. Visiting the dentist is a dreadful experience in some minds, an image which was not helped by witnessing people leaving in pain, or covering their heads in bandages after a dental visit in the movies. Kids, in particular, were very susceptible to scary stories about dentistry gone wrong. Luckily, going to the dentist does not have to be a miserable experience for anyone. Going to the dentist for the first time is a great experience that can do wonders for your health. During a visit, you will see a dental hygienist, get x-rays taken of all your teeth, get a thorough cleaning, and have a consultation with a dentist. This comprehensive process gives your care team the big picture of your oral health, from which they can help maintain your good oral health, or recommend a treatment plan if necessary. A cleaning is the first step to a preliminary dental visit. Even if you take great care of your oral health, there are particles of bacteria that are difficult for us to see and clean with a toothbrush or floss. Dentists have precision tools to remove plaque and buildup from your teeth in much more detail. This cleaning also serves as a general inspection, allowing your dentist to uncover anything that needs attention. After the manual cleaning, comes a polishing, and often fluoride treatment, which you should get every six months. During your first dental visit, you will also get X-rays of your teeth in addition to the cleaning. This process which is typically repeated on an annual basis. X-rays allow your dentist to quickly see any trouble areas, and help guide your dental treatment plan. Many dental offices utilize digital x-ray machines nowadays, which make the process incredibly quick and easy. They can immediately pull up your x-ray onto a screen for convenient viewing, explaining what they see for you to easily understand. Following the x-rays and cleaning, your dentist will go over the results of your appointment and help determine your path toward achieving continued excellent oral health. If you’re an adult, a dental visit is a good idea if you haven’t been in the past year. It is encouraged to begin taking your child to the dentist on a regular basis at age 2, so if they’re at least that old and haven’t been at all, now is a great time to start. 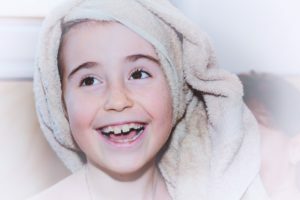 At Hassey Do Duy, we work with children to help them get over their fears with the dentist and provide top notch dental care to their growing smile. Children’s visits follow similar patterns along with all other patients, though we focus on different goals and patient histories. Our experienced, professional staff can help put your family at ease and get them through the experience with minor discomfort and an improved outlook on dentist visits. Everyone benefits from a brighter, happier smile, and regular dental visits are the best way to achieve that. Seeing a new dentist for the first time can sometimes be a challenge, but here at Hassey Do Duy, we strive to provide the best in new patient care. Call us and make an appointment to see how we can help you improve your bright smile today!